The I AM NO LAB RAT campaign underway in Delhi–to create consumer awareness on the adverse effects of Genetically Modified (GM) Brinjals–organised a colourful and unique ‘BRINJAL’ FESTIVAL in Dilli Haat yesterday. The festival was aimed at catching the Delhiites attention on this humble vegetable’s diversity being jeopardised and its socio-cultural importance discounted in government policies. 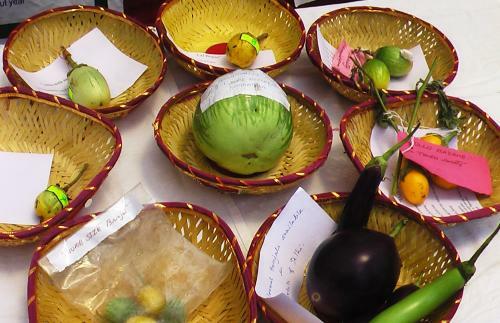 The novel event had more than thirty different varieties of Brinjal from different states on display. The brinjals on display included Mattu gulla, Ram gulla, Lal begun, Billi-gundu badane, Gauri Bidanur, Sada desi gol begun, Jungly variety, Musuku Badane, Kanta begun, Md. Kuli, Sada Makra, Banamala, Garia etc. The Indian diversity in brinjals is reflected in different colours of brinjals (not just the purple ones commonly seen but yellow, white and even red brinjals), in shape (long, round, bulbuous etc. ), in size, in the plant quality (spiny, hardy, short etc.) etc. The flavour and taste of the different varities of brinjals is also different. This rich diversity will be potentially jeopardized if Bt Brinjal is approved in the country as the first GM food crop. Most importantly for the Delhi belly, the festival also displayed a diversity of brinjal dishes from across the country. yes,I was there last Sunday,wonderful place!Is brinjal a veggie or fruit? Brinjal is very much a veggie! An organic farmer from the states should know that!!!! :p Navdanya is going to be there for good, they do have nice stuff! !